One of the main differences between reaction injection molding and standard injection molding is the use of thermoset polymers, such as polyurethane, instead of thermoplastics. Reaction Injection Molding – Molded Devices, Inc.
RIM is used in a host of industrial applications such as medical enclosures, automotive interior/exterior parts, telecommunications structures, laboratory and analytical housings, heavy equipment, agriculture, vehicle covers and various consumer goods. RIM is also used to make panels/covers for electronics, laboratory and analytical/scientific equipment, enclosures for medical devices, housings for computers and telecommunications equipment, ATM housings and a host of automotive components for the transportation industry. 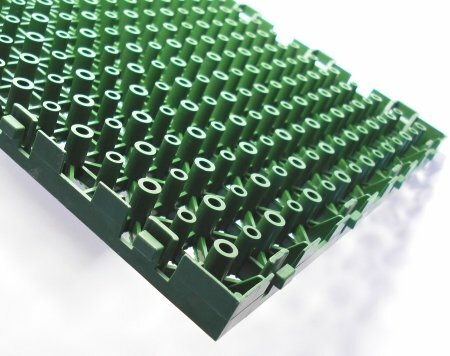 RIM parts are sturdy, durable and resistant to aging and weathering, and so the reaction molding process is often used to produce molded plastic parts such as radar antennae, telephone system shields and automobile bumpers that are required to withstand impact and abuse. RIM is an economical option for manufacturing these parts due to low labor costs, minimal material waste, use of low cost aluminum tooling and various material options. The process of reaction injection molding is named after the chemical reaction that takes place within the plastic in the injection, curing and cooling phases. Two liquid components – a polyol and an isocyanate component – are impinged upon each other at a mixhead and then injected (mostly by gravity) into a heated aluminum mold. These liquids chemically react – hence the term “reaction” injection molding – and then harden into the shape of the mold cavity. A foaming action occurs between the two components as a result of this chemical reaction and forms a cell structure that then fills out the mold cavity. The chemistries of the polyol and isocyanate coupled with the mix ratios determine the physical properties of the final foam material and the type of polyurethane part manufactured. The foam structure could be soft and flexible like a seat cushion, or it could be made to react and form with little foaming action to make a hard (solid), thin-walled foam to mimic the physical properties of an injection molded-type plastic such as a computer housing. The chemistries could be altered to allow for impact resistance as well as flexibility. The versatility of RIM is another advantage to the process; there is no limit to the variety of products that can be manufactured by RIM. Reaction injection molds are cost-effective and allow for greater design flexibility, but they have a lower production rate than standard injection molding due to the cure time involved, the size of the parts and the slower cycle times involved in the process. Advantages of RIM versus other low volume production methods are cost savings, part repeatability and consistency, weight savings, design freedom and overall part quality. Huge cost, weight and quality advantages can be reaped from RIM for operations that already use FRP (Fiberglass layup) as a production method. Due to the control over wall thickness and dimensional/assembly features it allows, RIM will produce a better fit and finished assembly every time compared to other processes. RIM also makes it possible to have very large draws as well as various wall sections without sink or distortion. RIM engineers can design for both the aesthetic side of the part (side A) and the working side of the part (side B) and apply many more DFMA principles. Reaction Injection Molding Reaction injection molding (RIM) is a plastic molding process commonly used for larger (parts up to 8' x 8'), geometrically-complex parts, rigid foam parts and parts that have lower annual production runs (100-20,000).